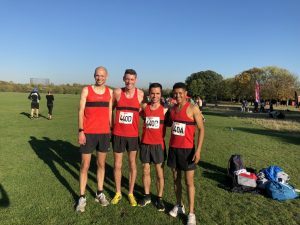 Medway & Maidstone AC Men’s team had a superb result in the Southern Cross-country Relay Championships at Wormwood Scrubs last Saturday. The relay race is competed for by teams of four with each runner completing a 5 Km grassy course. With all four runners having solid runs, the team finished in an excellent 7th place out of 42 teams from all across the South of England. Tewelde Menges ran the first leg in 14.29, followed by Ben Tyler 15:00, Mark Wilkins 15.31 and finally Tom Collins 15:00. Menges run was the 14th fastest of the day out of 177 runners. His and the others times bode well for the team who are competing in the Kent Cross-country League race this Saturday at Tonbridge.